Walk to the beach in no time from Spunkling! This is a perfect, single-family Outer Banks vacation rental with high cathedral ceilings and a comfortable living space. Relax on the wraparound deck or lounge in the loft living space. 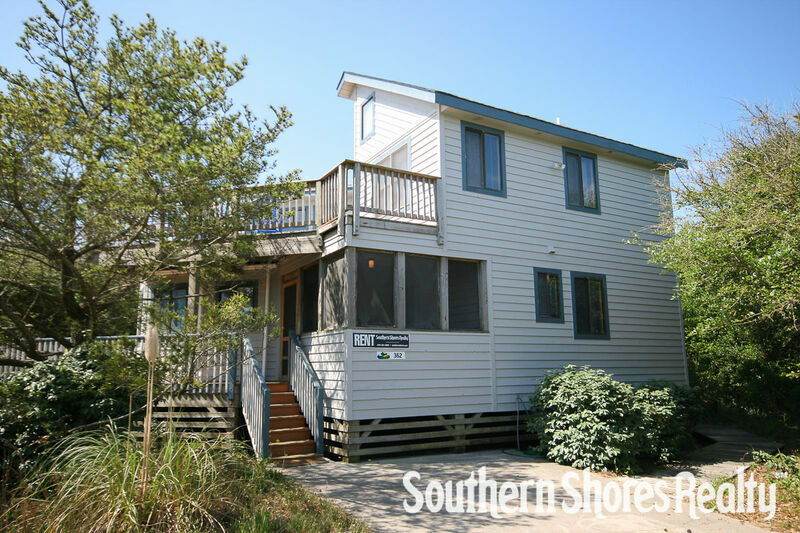 This home’s central location in Southern Shores means it’s close to Duck and Kitty Hawk shops and dining. Living area with vaulted ceiling, TV/VCR/DVD player, books, games; dining area; kitchen with breakfast bar, extra dining table, laundry closet. 2 bedrooms (1 with Double, 1 with Pyramid bunk and standard Bunk set), bath (tub and shower). Master bedroom (with Queen), bath (shower), loft with 1 Queen sleep sofa, TV/VCR player, wet bar with mini-refrigerator; sundecks with furniture. This house was perfect for our little family. It was a short walk to the beach and I felt other family members who were a couple of streets over flocked to our place to head to the beach or just for hangouts. We will be here again this year! Spunkling is a great little house. It's a little worn around the edges, but very comfy.